The days of Qantas' monopoly of the business and premium travel market between the east and west coast of Australia are now well and truly over. 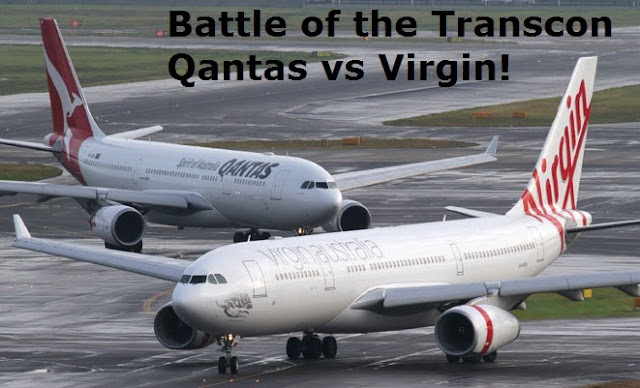 Since Virgin Australia's introduction of their domestic Airbus A330 in 2011 it has been an increasingly intense competition between the 2 carriers as to who can offer the best product, not only in business class but also in economy. Both carriers now also operate the majority of their flights between Perth and Sydney or Melbourne with widebody Airbus A330s. However, depending on which aircraft you get on the day both airlines have wildly varying configurations on the seats! At this stage Qantas is operating with at least 3 different seat types in business and Virgin has 2. I will go into more detail in each of my reviews. Upon arrival at the terminal I am greeted by Virgin posters telling me 'The romance is back'. Well Virgin, let's just see about that! From curbside to lounge its just a few moments as the security checks are actually done on the way to the gate. Upon arrival in the lounge (actually called 'The Lounge') I went to the counter to get my boarding pass printed. I was handed back a boarding pass for seat 1B, having pre selected seat 1A online I questioned what happened. I was told they had just been advised that seat 1A was out of service so I had been moved, but with 1A unoccupied I would have 2 seats worth of space. I suppose I should not be surprised as I had heard that Virgin's 2 A330's that they received from Emirates (VH-XFA and VH-XFB) are regularly experiencing technical difficulties. It was a shame today's flight was being operated on XFA as the seats are recliners instead of the new pod style angled lie flats on the 4 new aircraft. Still, they are a decent seat by domestic standards. The lounge is decent and I certainly appreciate the barista coffee, however the food selections were quite boring. I didn't partake since I knew I had a full lunch coming up. I must say though since the lounge opened after its renovations it is already showing signs of wear and tear, apparently an extension is under construction to expand it as I imagine it can get quite busy at times. My flight being a Sunday lunchtime meant the lounge wasn't exactly crowded and finding a seat was easy. I decided to head to the gate early to take a few photos and observe the boarding process. The trip from the lounge to gate 4 was quite quick and the priority security screening for business class and Virgin elite frequent flyers worked well. By the time I arrived boarding had commenced and once again the priority boarding lane worked well even with the sole person scanning boarding passes. Within moments I was on board and being welcomed by a friendly crew. As I was stowing my bags and getting comfortable a crew member arrived by my side to collect my jacket to be stored in the wardrobe. Shortly afterwards I was being offered pre departure drinks and I was impressed to see champagne being offered for a domestic flight (and this was real champagne, not sparkling wine). For those interested to know, the champagne on offer on these Virgin Coast to Coast services is Lanson. Not the best champagne on the market but it's decent enough. The crew on this flight were mostly under 30s and all very friendly and welcoming. Whilst boarding was under way they went around the cabin distributing menus which came in booklets with separate wine lists. The presentation of the menu was definitely of an international business class standard and very impressive. A basic amenity kit was also provided which I wouldn't normally expect on a domestic flight of this length. Although the passengers were asked to remain seated the crew were allowed to commence inflight service and to get us started on this lunchtime flight we had a bowl of hot nuts and a glass of chardonnay. The fact that the nuts had been heated was a very nice touch and left me rather impressed! This particular aircraft has TV screens available in every seat with a number of channels available but the entertainment is not 'on demand'. Instead it runs on a loop system. The newer aircraft though do have audio video on demand. In recent times I tend to avoid the airlines entertainment system anyway, preferring to watch shows on my android tablet. For this flight I had pre-loaded several episodes of 'Mr Selfridge' which I have been really enjoying! A table cloth was placed on the tray table and the first course arrived on a single purple tray with celebrity chef 'Luke Mangan' branding. Bread was immediately offered to go with my meal. One thing I do like is the olive oil and dukkah that come on the tray to be used with the bread, very tasty. Interestingly Virgin don't use proper wine glasses instead using the same tumblers they serve the water in. Maybe this is supposed to be stylish but I don't like it, please switch to a proper wine glass in future Virgin. With the very tasty duck appetiser complete it was time for the main course, the beef. It came perfectly arranged on a large plate and it looked magnificent. Presentation was perfect and the taste even better, the beef melted in the mouth and the potato gratin was just right. It was one of the better main courses I had been served on an aircraft. The crew member looking after me was always aware of my 'wine situation' and topping up as required which pleased me, there is nothing worse than running out of wine during a meal! Once the main was finished the crew came around and took the tray away leaving the table cloth. A short time later the dessert trolley came out but for some reason they commenced in the right hand aisle and went to the back before moving to my aisle and starting from the back and going to the front. This meant that I was served dessert last. As a result I did not have a choice of cheese or dessert or both, I had to accept the only remaining option which was chocolate lava cake. Had I not been a fan of desserts I would have been pretty annoyed not to be able to have cheese. Ideally I think a cheese course should be offered in addition to dessert. The weather in Perth was pretty nice so a smooth descent and landing followed before a quick taxi to the gate. The delay on the ground in Melbourne and the very long flight time over due to the wind meant we pulled into the gate at 4.13pm local time, a full 58 minutes behind schedule. My jacket was returned to me from the wardrobe and it had been places in a very cute Virgin Australia branded suit bag on it's own hanger for me to keep. That was a very unexpected surprise and I still have it hanging in my closet at home! Overall I had a great time on this Virgin Australia flight. I mostly fly Qantas domestically but Virgin have really stepped up and now have a fabulous product. Next up I am going to review the Qantas flight in the reverse direction and then I will follow up with an article comparing the two. Great review, thank you. It's hard to tell from the picture but I wonder if the tumbler in which you were served your wine was actually a stemless wine glass - perhaps a copy of the Riedel wine tumbler? I'm not a fan of these, but they are 'real' wine glasses. Seriously virgin Qantas is still the better airline In my opinion! Look at the overhead lockers don't see those anymore! Excellent review and it looks like a decent product, i'm looking forward to flying Virgin Australia again next year, i have not flown with them since 2009. I suspect things are very different now. Nice review! They are indeed stemless wine glasses, as in they are designed to be the optimum shape for wine drinking without a stem. I find them much more stable in-flight too.